Last month, 10 students from the Desert Mountain Area Health Education Center (AHEC) Collegiate Double T Honor Society attended the 2017 International Leadership Conference in Orlando, Florida. 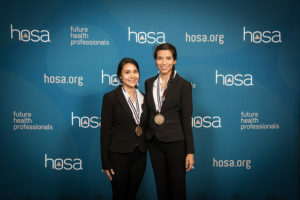 The conference, held June 21 through 24, is an opportunity for members of the Health Occupations Students of America (HOSA) to strengthen their scholastic, professional, and leadership skills. 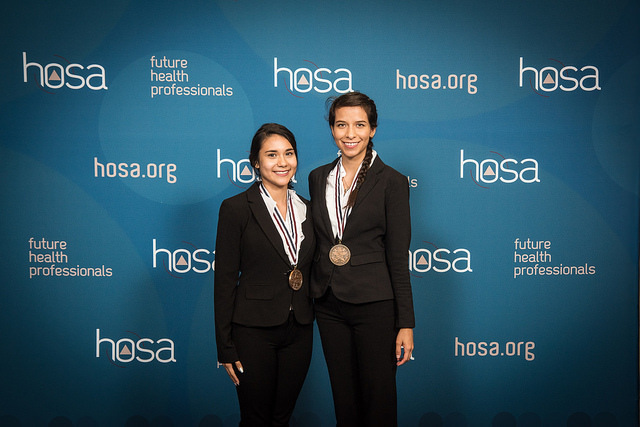 The Double T academic honor society, which is part of HOSA, helps guide pre-health professional students into health care fields like those offered by Texas Tech University Health Sciences Center El Paso (TTUHSC El Paso). Last month, students in the Collegiate Double T Honor Society attended the 2017 International Leadership Conference in Orlando, Florida. “Our organization’s main objectives for its members are to encourage scholastic success, provide exposure to health careers and graduate school curricula, serve and provide aid to the community, and strengthen professional skills,” said TTUHSC El Paso’s AHEC Coordinator and Double T Advisor Uriel Acuna. One of the organization’s main outreach efforts is to provide lecture-style presentations led by instructors from the university’s Paul L. Foster School of Medicine, Gayle Greve Hunt School of Nursing, and Graduate School of Biomedical Sciences. To qualify for the national conference, all 10 students attended a statewide competition in Corpus Christi, Texas, March 30 through April 3. Selection criteria included exam scores, skills tests, and health career displays. The Double T students earned top scores in current health issues, CPR and first aid, public service, and behavioral health, among others.